Looking back to September where we were still blessed with fairly kind weather instead of constant downpours, gales and storms as we are now! The Finnish Air Force had sent a detachment of Hawk Mk51's over to RAF Valley for DACT etc with IV & 208 Squadron. With the forecast looking favourable and it looking fairly likely that the Finnish Hawks would drop in for a spot of LL around the Mach Loop I decided to head up. The choice of location was the top shelf (depending on who you ask!) of the Bwlch, not one of the best locations IMO but it beats shooting into the sun all day as you would have on Cad West. The backseater records footage on his mobile phone while the frontseater negotiates the Bwlch. Things finally kicked off around 1140 with an RAF Hawk T1 from 208 Squadron, 20 minutes later two Finnish Air Force Hawk Mk51's appeared. In total we were treated to 10 passes from the Finnish spread throughout the day as sorties recovered and launched at Valley. They gave a true demonstration of low level flying and looked particularly sporty in their grey scheme. Finnish Air Force Hawk Mk51 low level through the Bwlch with the A470 in the background. 63º swept Tornado GR4 wearing 12(B) Squadron markings. The RAF put in an appearance as well with three fantastic swept 63º (due to hindenburger tanks) passes from Marhams finest, some particularly passes which is always good to see. The first pass was so quick I completely lost the jet in the viewfinder! 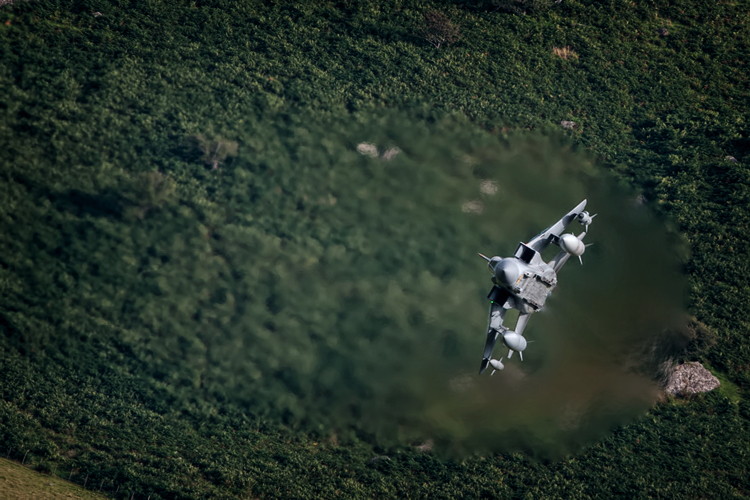 With the wings swept back to 63º the pilot takes the tight turn for the Bwlch. Apologies for the lack of updates recently but I've been sidetracked with a few things and I just haven't had the desire to go out and take photos recently. I've had some good news that has got me back in the mood shall we say, I shall soon be off to Portugal to spend 3 days with 751 Squadron of the Portuguese Air Force. All very exciting!